During an export to the FIM Portal via the FIM Service Management Agent, the error "Failed-Creation-Via-Web-Services" error appears in the Synchronization Service Manager Console. 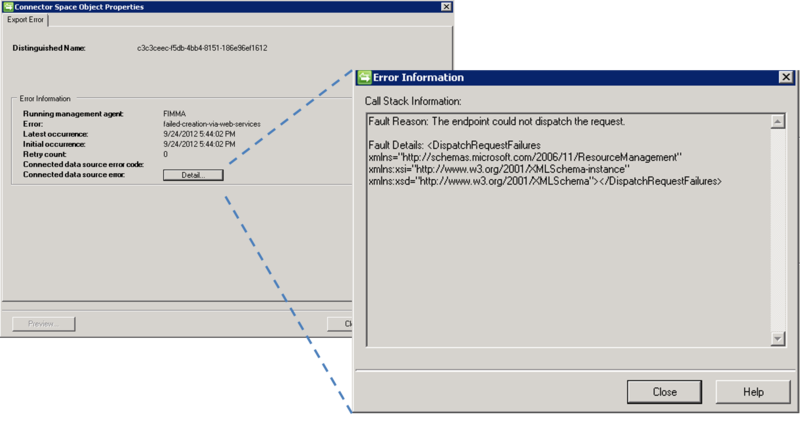 Through investigation into the "Failed-Creation-Via-Web-Services" the Details displays "The endpoint could not dispatch the request". Very similar to the below mentioned pictures. This particular case the issue was because the account specified in the FIM Service Management Agent, and the account specified during installation stored in the Windows Registry were different. Make the account specified in the FIM Service Management Agent match that that is in the registry.